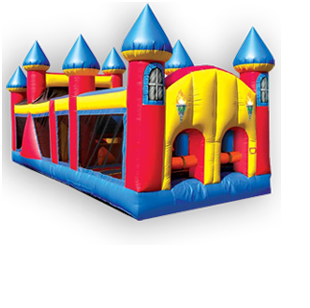 Prices include delivery, set up and tear down within a 20 mile distance from Davenport and the Quad Cities. Extra charges apply for farther distances than 20 miles from the Quad Cities. 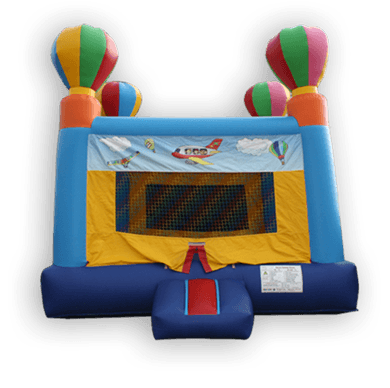 This 15 x 15 foot inflatable bounce house never leaves the ground, but don't tell the kids that! They will jump so high and have so much fun, they will think they've taken flight. Again, this inflatable is perfect for kids of any ages. 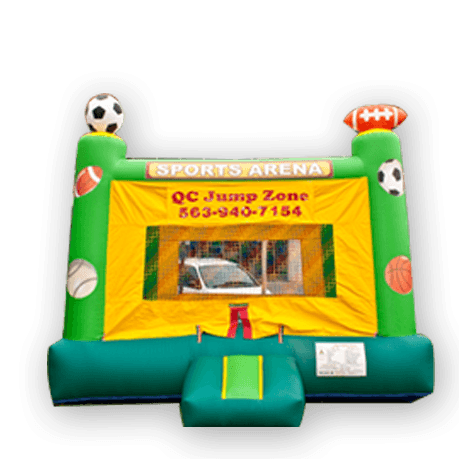 This 15 x 15 ft. bounce house will delight the sports enthusiast in your home. 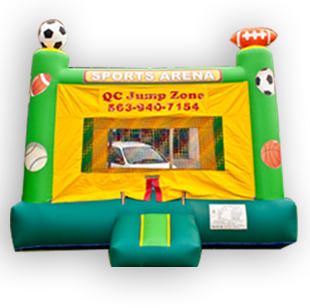 This brightly colored jump grabs your attention with an inflated soccer ball and football on top and provides hours of entertainment. 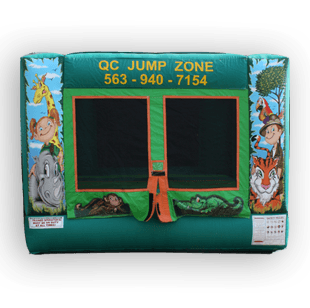 Our 10 x 13 foot inflatable bounce house with its bright color and animal prints is the perfect fit for a preschool party or younger kids. It's only 7 feet 10 inches tall so you can even use it indoors or in the garage! Children 5 and younger feel like they are on a real safari. 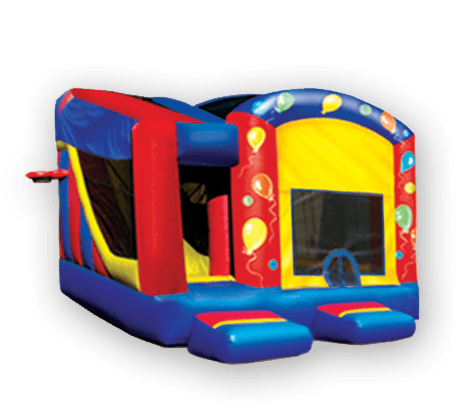 At an additional charge we can provide a matching bean bag toss and even a duck pond so the kids have other party games to play. This is 30 feet of pure adrenaline! 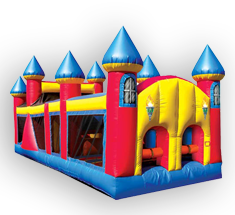 Our obstacle course is perfect for kids of any ages (yes parents, that includes you). It's great for races. 2 participants at a time make their way thru obstacles of varying heights and sizes until they reach the end. Then, the first one up the ladder and down the slide wins! 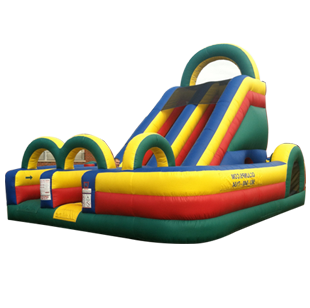 Our new jump/ slide combo offers all kinds of fun! 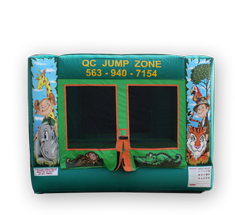 This unit has an area to jump, a slide, and basketball hoops located in and outside of the unit. 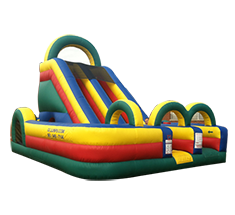 Our obstacle courses are a huge hit with the kids and this new unit is no exception. 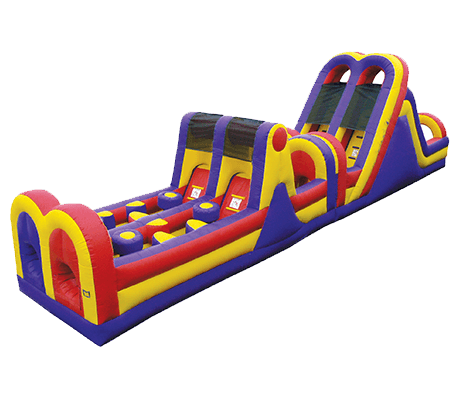 The unit offers 2 lanes so kids can race through the obstacles, tunnels, and has 2 slides. We affectionately call this one the "Beast" due to it's size. 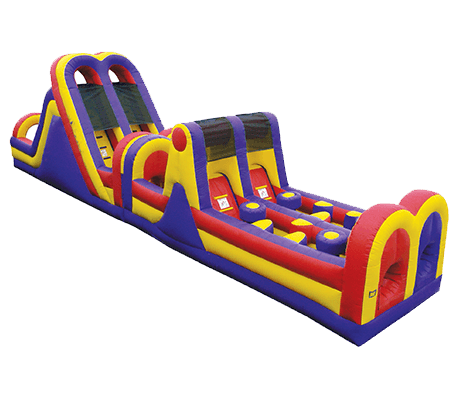 This gives you the best of both worlds...an 18 ft. Slide with a Obstacle course wrapped around it. It's 18 feet of excitement. The kids can't get enough of this one. 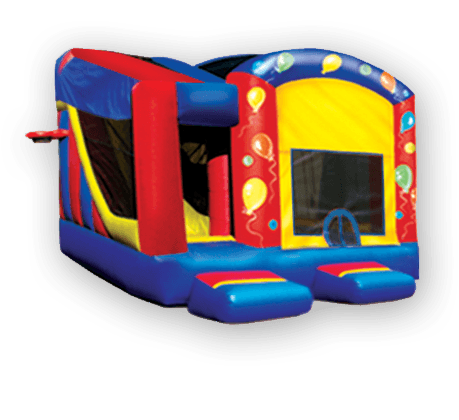 From toddlers to teens, we rent this for preschool parties and graduation get-togethers. 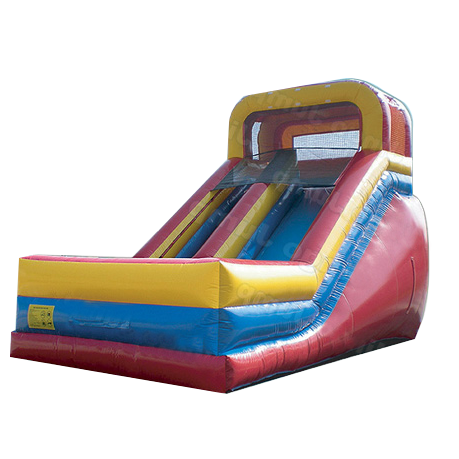 The kids will spend hours climbing the ladder and sliding down this inflatable and the smiles will never leave their faces. Treat your little princess to a party fit for royalty. 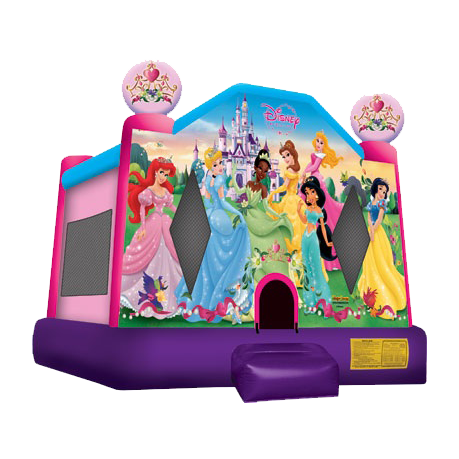 This 15 x 15 foot bounce house will bring a little Disney magic to her special day. 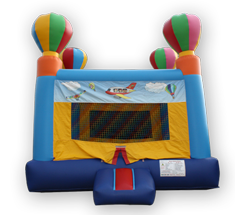 The perfect inflatable for your little superhero. 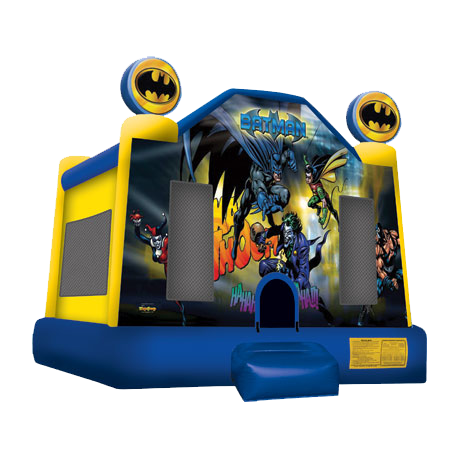 This 15 x 15 foot bounce house is the perfect way to burn off some energy after a day of fighting crime in Gotham. SpongeBob, Patrick and Squidward will keep your little sea urchin busy. 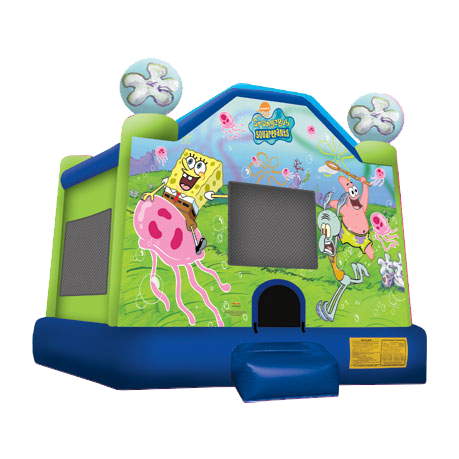 This 15 x 15 foot bounce house is the perfect way to go under the sea without getting wet.